Trim stems off fennel bulb to within 1/4- inch of bulb. Reserve some leaves for garnish. Cut fennel into quarters; slice crosswise. 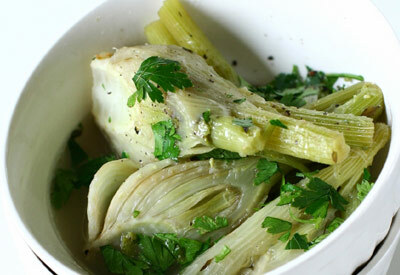 Place fennel in saucepan with broth or water to cover. Bring to a boil; reduce heat. Simmer, partially covered, for 15 minutes or until tender. In same pan, heat oil; saute mushrooms with shallots and garlic until tender. Toss with fennel; sprinkle with salt and pepper. Garnish with some of the reserved fennel leaves.